Astronomers at the 29th International Astronomical Union General Assembly will announce on August 14 the discovery of a new transiting "circumbinary" planet, bringing the number of such known planets into double digits. A circumbinary planet orbits two stars, and like the fictional planet "Tatooine" from Star Wars, this planet has two suns in its sky. The discovery marks an important milestone and comes only four years after the first Kepler circumbinary planet was detected. Once thought to be rare or even impossible, these ten discoveries confirm that such planets are common in our galaxy. The research was recently published in the Astrophysical Journal. The new planet, known as Kepler-453b, also presented astronomers with a surprising twist—the tilt of the orbit of the planet rapidly changes, making transits visible only 9 percent of the time. "The detection was a lucky catch for Kepler," said William Welsh, professor of astronomy at San Diego State University and lead author of the study. "Most of the time, transits would not be visible from Earth's vantage point." The change of orientation of the planet's orbital plane, known as precession, brought it into proper alignment halfway through the space telescope's lifetime, allowing three transits to be observed before the end of the mission. "The low probability for witnessing transits means that for every system like Kepler-453 we see, there are likely to be 11 times as many that we don't see," added co-author Jerome Orosz, also a professor of astronomy at San Diego State University. The precession period is estimated to be approximately 103 years. The next set of transits won't be visible again until the year 2066. Kepler-453 b is the third Kepler circumbinary planet found to lie in the habitable zone of its host pair of stars. The astonishingly high rate of occurrence in the habitable zone is caused by the types of stars observed by Kepler (generally Sun-like) and the need for the planet to be sufficiently far from the stars for its orbit to be stable. In a binary star system, the habitable zone is more complex than around a single star, but it can be readily calculated once astronomers know the masses, radii, and temperatures of the stars. However, Kepler-453 b is a gas-giant planet and is unlikely to harbor life as we know it. Based on the amount of starlight blocked during the transits, astronomers deduced that Kepler-453 b has a radius 6.2 times greater than that of the Earth. The mass of the planet was not measurable with the current data, but is likely to be less than 16 times that of the Earth. The planet takes 240 days to orbit its parent stars, while the stars orbit each other every 27 days. The larger star is similar to our own Sun, containing 94 percent as much mass, while the smaller star contains only 20 percent as much mass and is far cooler and fainter. The system is in the direction of the constellation Lyra, some 1,400 light-years away, and is estimated to be between 1 and 2 billion years old, much younger than our solar system. With the number of known circumbinary planets now at ten, astronomers can begin to compare different systems and look for trends. The systems tend to be very compact and they come in a wide range of configurations. "The diversity and complexity of these circumbinary systems are wonderful," Welsh said. "Each new circumbinary planet is a gem, revealing something unexpected and challenging." 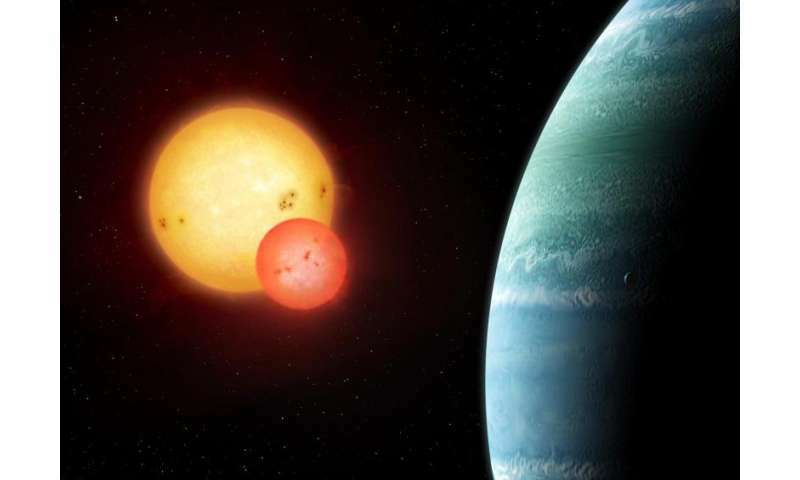 And their tendency to be in the habitable zone is a bonus, spurring astronomers to keep searching for Earth-size circumbinary planets in the Kepler archive. The finding complements SDSU's previous success with Kepler data. In 2012, Welsh and Orosz discovered the first instance of a two-planet circumbinary system: two planets orbiting a pair of suns. These discoveries were made possible by NASA's Kepler Mission, whose precision and long-term monitoring of the same set of stars made it an ideal planet-discovery telescope. 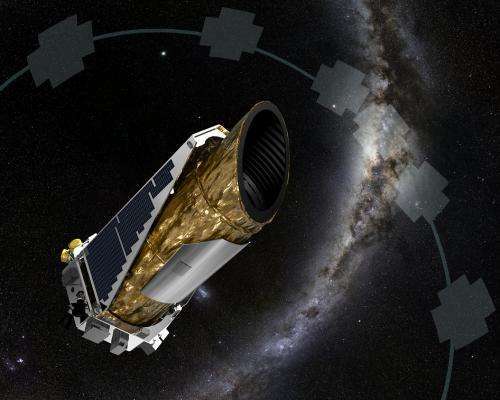 Although the mission ended in 2012, the space telescope continues to collect data as the K2 Mission, and the archive of data from Kepler will keep astronomers busy for years. "...these ten discoveries confirm that such planets are common in our galaxy..."
I'm gonna need more than ten to admit they're "common." Kepler went up in 2009 and the first circumbinary was parsed from data in 2012. Here a scant 3 years later the total circumbinaries comes to 10. Another way of looking at it would be of the ~1000 confirmed planets from Kepler only 10 are circumbinary. Common is in the eye of the beholder?